Mike Skinner picked up the 11th last-place finish of his NASCAR Sprint Cup career in Sunday’s Coca-Cola 600 at the Charlotte Motor Speedway when his #60 Big Red Toyota fell out with a vibration after completing 6 of the race’s 402 laps. Skinner qualified 43rd for Sunday’s race at a speed of 186.774, beating five other “go-or-go-homers” who failed to qualify. Skinner edged Andy Lally for the final spot in the field by 0.019 second. Lally’s speed of 186.651 mph came on his first timed lap before his loose #71 Ford lost control entering turn three the next time by. Despite his rookie status, Lally saved the car from wrecking, sustaining only minor damage to the left-front. Still, Lally left the track with his second DNQ of 2011. Skinner remained in the rear of the field as the team decided to run a backup car. Six laps into Sunday’s race, Skinner was still running near the tail end of the field when he scraped the wall in turn three. Spotter communications indicated the car did not suffer significant damage, but Skinner was concerned about a vibration the car had developed. After a brief discussion with his crew chief and spotter, Skinner pulled the car behind the wall, ultimately ending their race. *It was Skinner’s first last-place finish since last month’s Samsung Mobile 500 at Texas, where he and the #60 team fell out after 36 laps due to a rear gear failure. *The last time Skinner finished last in a Cup race at Charlotte was in 2006, when his #72 Dutch Quality Stone Chevrolet crashed after the opening lap of the 2006 Bank of America 500. *The last Cup driver to finish last at Charlotte due to a vibration was Mike Bliss, whose #09 Phoenix Racing Dodge fell out 42 laps into the 2009 Coca-Cola 600. 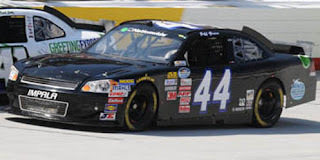 Jeff Green picked up the 19th last-place finish of his NASCAR Nationwide Series career in Saturday’s Top Gear 300 at the Charlotte Motor Speedway when his #44 TriStar Motorsports / Pro Motor Engines Chevrolet fell out after 4 of the race’s 200 laps with a vibration problem. The finish is also Green’s 22nd last-place finish across all three NASCAR divisions, tying him for 6th on the all-time rankings with Johnny Chapman and Kevin Lepage. Green qualified 35th for Saturday’s race at a speed of 176.338 mph, beating six other “go-or-go-home” drivers including Chase Miller and Charles Lewandoski, who failed to qualify. Four laps into the race, Green went behind the wall, followed one lap later by two-time last-placer Kelly Bires and two laps before David Green. *This is Green’s second last-place finish in a Nationwide Series race at Charlotte, the other coming in 1996 Red Dog 300 at Charlotte when his #3 Goodwrench Service Chevrolet lost its engine after 14 laps. *The #44 had not finished last in a Nationwide Series race at Charlotte since 2001, when Mike Harmon’s www.firehero.org Chevrolet fell out with rear end trouble 7 laps into the 2001 Little Trees 300. Green re-takes the lead in the 2011 LASTCAR Nationwide Driver’s Championship, breaking a tie with fellow two-time finisher Kelly Bires, who came home 42nd. 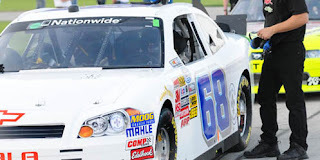 Brett Rowe picked up the 3rd last-place finish of his NASCAR Nationwide Series career in Sunday’s Iowa John Deere Dealers 250 at the Iowa Speedway when his #55 Imperial Bedding Company Chevrolet fell out with brake problems after 2 of the race’s 250 laps. Rowe, 9th in the 2006 ARCA series championship with two Top 5s and six Top 10s, has been running part-time in the Nationwide Series since 2007. In 28 Nationwide Series starts, Rowe has a best career finish of 21st, where he finished on three occasions, most recently at Montreal in 2009. Sixteen of Rowe’s starts came with veteran owner Wayne Day, whose #05 Chevrolets are currently driven by David Starr and Willie Allen. This year, Rowe was tabbed to drive a second car for another series veteran, 69-year-old Morgan Shepherd, owner-driver of Faith Motorsports. 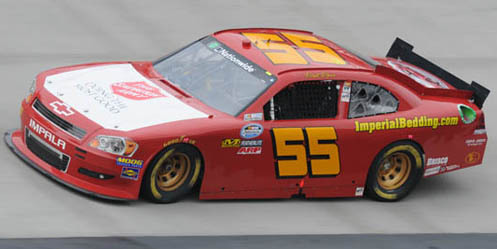 Running a #55 with longtime sponsor Imperial Bedding Company on his Chevrolets, Rowe has so far qualified for 6 of the 8 races his team has attempted. However, as a “start-and-park” team to fund Morgan Shepherd’s full-time ride (car #89), Rowe has so far completed no more than 12 laps in a race this season. His best finish came after those 12 laps at Las Vegas, where he came home 36th. Shepherd’s best finish also came in that race, where he finished four laps down in 18th. At Iowa, rain washed out qualifying for Sunday’s race, so all 43 cars on the entry list made the field, including Rowe and Shepherd. Rowe would line up 36th while Shepherd, making his 300th series start, started 31st. Two laps into the race, Rowe pulled behind the wall, earning his first last-place finish of the season. Shepherd went on to finish 20th, his second-best finish of the year. 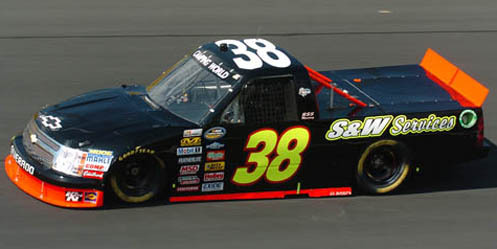 Shepherd has competed in all but four seasons in the 28-year history of the Nationwide Series. *Rowe had not finished last in a Nationwide Series race since 2008, when his #05 CertainTeed / 31-W Insulation Chevrolet lost the engine and crashed nine laps into the 2008 Pepsi 300 at Nashville. *The #55 has not finished last in a Nationwide Series race since 2008, when Scott Gaylord’s Bennett Classics Museum Ford lost the engine two laps into the 2008 Bashas’ Supermarkets 200 at Phoenix. 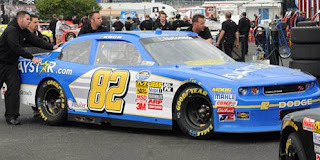 *Faith Motorsports has also not finished last in a Nationwide Series race since 2008, when owner Morgan Shepherd’s ignition failed on the #89 Victory in Jesus Racing Dodge without completing a lap of the 2008 Meijer 300 at Kentucky. Kasey Kahne finished last in Saturday’s NASCAR Sprint All-Star Race at the Charlotte Motor Speedway when his #4 Red Bull Toyota was involved in a single-car crash after completing 59 of the race’s 100 laps. Coming off his track record-setting pole and fourth-place finish at Darlington two weeks ago, Kahne was eligible to run the All-Star Race by virtue of his 2008 victory in the event. In qualifying, Kahne’s team put up the 7th-fastest time without receiving any penalties. Though his team did not claim the Pit Crew Challenge on Thursday, Kahne claimed a victory of his own in the Pennzoil Ultra Victory Challenge the afternoon of the main event. In the race itself, Kahne was able to stay in touch with the leaders at various moments, running up to 4th on Lap 26 after he took a two-tire stop. A second two-tire stop at the end of Segment 1 on Lap 50 moved him up to 2nd behind Carl Edwards, and he held onto the Top 5 after the restart. However, on Lap 59, the run came to an end when Greg Biffle got him loose entering turn one, causing his Toyota to slap the outside wall hard enough to strip off most of the paint on the passenger side. The wreck put Kahne behind the wall that same lap, making him the first retiree. Brad Keselowski, at the time six laps down due to his own brush with the wall, was then moved up from last. Thanks to being the only car laps down in the closing stages, Keselowski received enough Lucky Dogs to come home one lap behind in 18th. Carl Edwards, who finished last in the 2010 All-Star Race, went on to win. *With the finish, Kahne became the second driver to finish last in both the Budweiser Shootout at Daytona and the NASCAR Sprint All-Star Race in the same season. The other driver to do it was John Andretti, driving Richard Petty’s #43, in 2000. Andretti was credited with a last-place finish in the 2000 Budweiser Shootout as the #43 team rendered itself ineligible for the Bud Pole Award pursuant to a family agreement. *This is the first time Kahne, the #4, and Team Red Bull have ever finished last in the NASCAR Sprint All-Star Race. *This is Toyota’s second last-place finish in the NASCAR Sprint All-Star Race, joining Kyle Busch’s last-place showing in 2008. That night, Busch led 38 laps, the most of any All-Star last-placer. Derrike Cope finished last in Saturday’s Sprint Showdown at the Charlotte Motor Speedway when his #64 Morningstar Marinas Ford was involved in a frightening two-car crash after completing 2 of the race’s 40 laps. Cope, the all-time leader in NASCAR last-place finishes with 35, had twice attempted to enter a Sprint Cup race this season in his own equipment. Both times, which came at Martinsville and Darlington, Cope was forced to withdraw his #75 when the engine on his car was not turning out enough power. The latest news from Cope’s team has shown promise, however, as he switched manufacturers from Dodge to Chevrolet before the Darlington race and had gained sponsorship funds from Maxellence Energy Drink. Still unwilling to bring his Chevrolet to Charlotte for the Sprint Showdown, Cope instead accepted an invitation from car owner Larry Gunselman to run his #64 in the race. It would be the first appearance of the #64 since SpeedWeeks at Daytona, during which Cope came up short of racing the Sta-Bil Toyota into the Daytona 500 after a 14th-place run in the second Gatorade Duel. Thanks to a partnership with Front Row Motorsports, Gunselman had also switched manufacturers from Toyota to Ford and had operated Front Row’s #37 team since Bristol with Tony Raines as the driver. Gunselman would also have sponsors for both his cars in the 27-car field, with Black Cat Fireworks and Firehouse Subs for Raines (part of an extended sponsorship deal through the summer) and Morningstar Marinas for Cope. Cope qualified 25th for the Showdown at a speed of 181.781 mph, starting one row behind Raines, who timed in 23rd. At the start of the race, Cope was holding his own after Raines slapped the wall on the opening lap. Then, as the third lap started, Landon Cassill’s #09 blew a left-rear tire entering turn one, sending him sliding up into traffic. Cope picked the high line, looking to follow David Stremme’s #30, but Cassill’s car closed the hole. With nowhere else to go, Cope slammed into the left-rear of Cassill’s Chevrolet with enough force to lift the #09 off the ground. Though Cope rolled to the apron of turn two and did not drop the window net, both he and Cassill emerged unscathed. 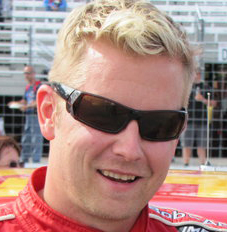 Due to his lower running position on the previous lap than Cassill, Cope was credited with the last-place finish. *This is the first time Cope, owner Larry Gunselman, and the #64 have ever finished last in the Sprint Showdown. *The last thirteen runnings of the Sprint Showdown have now seen thirteen different last-place finishers. 1998 saw the most recent repeat last-placer when Andy Hillenburg’s #95 suffered an oil leak on the opening lap of the 1998 Winston Open, joining his last-place run in 1996 driving Andy Petree’s #33. *Ford had not finished last in the Sprint Showdown since 2007, when Jon Wood’s #21 Motorcraft Ford was involved in a multi-car crash during the opening lap of the 2007 Nextel Open. Mike Garvey picked up the 7th last-place finish of his NASCAR Camping World Truck Series career in Friday’s North Carolina Education Lottery 200 at the Charlotte Motor Speedway when his #38 S&W Services Chevrolet fell out with transmission problems after completing 4 of the race’s 134 laps. Garvey now stands alone as 5th in the all-time Truck Series last-place standings, six finishes behind series leader Wayne Edwards with 13. In qualifying, Garvey timed in 34th at a speed of 168.982 mph, enough to best three other “go-or-go-home” trucks including Daytona last-placer Norm Benning, whose #57 was the only truck sent home. Before the first of a record 10 cautions flew on Lap 9, Garvey’s truck had already pulled behind the wall five laps earlier. Finishing 33rd after a hard crash was Wes Burton, who gave owner Jim Rosenblum his first Truck Series start since Andy Lally timed in 20th last fall at Talladega. Burton’s qualifying run was enough to give the FDNY Racing team its eighth start in the last six seasons, rebounding from a DNQ in the Charlotte race last spring. Burton and the #28 FDNY Chevrolet started last in the field at a speed of 165.022 mph, edging Norm Benning for the final spot by just under two tenths of a second. Rosenblum has fielded entries in NASCAR as far back as 1983, when he put Cup driver Jocko Maggiacomo into the field for the 1983 Mason-Dixon 500 at Dover. Maggiacomo drove in the majority of Rosenblum’s 27 Cup starts - 11 in all - with a best finish of 24th in the 1987 Summer 500 at Pocono. In a tragic twist, when the team returned to Pocono the following June, Rosenblum’s #63 Chevrolet finished last, destroyed in a terrifying first-lap crash with Bobby Allison that ended Allison’s racing career. Six more drivers would race for Rosenblum until the team’s final Cup race was run in 1993. Rosenblum’s current Truck Series team debuted during the series’ inaugural season in 1995, during which his #51 Chevrolets made 12 races with driver Kerry Teague. Teague finished a season-best 13th at both Tucson and Bristol. The following spring, driver T.J. Clark gave Rosenblum his team’s best finish to date, a 12th at Phoenix in 1996. 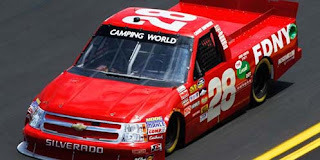 As of now, Rosenblum’s team has qualified for 38 races in the Truck Series. *Garvey is the first repeat last-place finisher in the 2011 Truck Series season. He was also the first driver to repeat last year when he finished last in consecutive races at Charlotte and Texas. *This is Garvey’s second consecutive last-place finish in this event: his #93 S&W Services Chevrolet fell out 9 laps into the 2010 North Carolina Education Lottery 200 with engine trouble. *Garvey is the first Truck Series driver to finish last due to transmission trouble since 2010, when Johanna Long’s #20 Panhandle Grading & Paving Toyota fell out on the opening lap of the 2010 Smith’s 350 at Las Vegas. Garvey’s is the fifth consecutive Chevrolet to finish last in the series. Out of the seven races run so far this season, Travis Kvapil’s Toyota at Phoenix is the only non-Chevrolet to finish last. Michael McDowell picked up the 11th last-place finish of his NASCAR Sprint Cup Series career in Sunday’s FedEx 400 Benefitting Autism Speaks at the Dover International Speedway when his unsponsored #66 HP Racing LLC Toyota fell out with electrical problems after 45 of the race’s 400 laps. Last week at Darlington, McDowell and the HP Racing LLC team decided to leave the Showtime Southern 500 early after an incident with Mike Skinner’s #60 on Lap 5. Crew communications indicated that, even though the damage was not significant and that the team had enough funding to run the whole race, they were planning on running the same car at Dover and did not want to risk it being destroyed. Skinner, running 43rd at the time, then returned to the track several laps down, running just long enough to slip McDowell back to 43rd before he also called it a night. 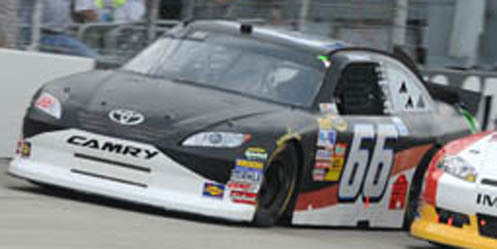 At Dover, McDowell and the Darlington car returned, though now without the K-Love decals on their black-and-white Toyota. This time, qualifying was rained-out, but since the team was fastest among the “go-or-go-homers” in practice, they secured the 36th spot on the grid. Skinner and the #60 were locked-in as well, lining up 39th on race day. When the green flag flew, first Joe Nemechek, then Andy Lally slipped to 43rd after Kyle Busch, sent to the rear due to a Friday engine change, drove by them both in the early laps. Lally’s #71 was the first car to lose a lap, earning him the Lucky Dog when Joey Logano’s spin brought out the first yellow on Lap 20. Just before the Lap 24 restart, McDowell fell to the rear of the field and Skinner pulled behind the wall, dropping Skinner to 43rd and Logano to 42nd. McDowell remained on the track through the Lap 41 competition caution, which allowed him to stay out and lead two laps. Only then, just after the restart on Lap 45, McDowell also pulled behind the wall. Once again, Skinner made another trip out onto the racetrack by Lap 63, at which point his Toyota was more than a dozen laps down. Just like at Darlington, this extra run dropped McDowell to 43rd in the final running order. Skinner pulled out after 51 laps as his car handled so badly that he could barely keep out of the leaders’ path during the long green-flag runs of the race. This inched him past the #30 Inception Motorsports entry of David Stremme, who became NASCAR’s random selection for post-race inspection following his exit after 47 laps. Skinner finished 41st, even though running one more lap would have put him past J.J. Yeley’s #46 for 40th. *This was the first time McDowell had ever finished last in a Cup race at Dover. Also, the #66 had never before finished last in any of the previous 82 Sprint Cup races held at the track. *McDowell is the first Cup last-placer to lead laps since Denny Hamlin led 74 laps, then blew an engine 143 laps into last fall’s Emory Healthcare 500 at Atlanta. Blake Koch picked up the 1st last-place finish of his NASCAR Nationwide Series career in Saturday’s 5 Hour Energy 250 at the Dover International Speedway when his #82 Daystar.com Dodge was involved in a two-car crash during the opening lap of the 209-lap race. The finish came in Koch’s 12th series start. In his third season of driving for Randy and Pat MacDonald’s Nationwide Series team, Koch has qualified for nine of the season’s first eleven races, culminating in a career-best 16th at Talladega last month. Saturday’s race at Dover would see Koch switch numbers with part-time teammate Donnie Neuenberger, giving Neuenberger his second opportunity of the season to drive the team’s primary #81 car. Koch was moved to the #82, which netted him the finish at Talladega. 46 cars were on the initial entry list, but when rain washed-out qualifying, three teams with last-place finishes this season were paid to withdraw by Rusty Wallace Racing: Matt Carter (#68, Texas), Mike Harmon (#74, Fontana), and Johnny Chapman (#75, Nashville). This allowed David Reutimann, driving for Wallace’s “go-or-go-home” third team (#64) to compete in the race sponsored by team sponsor 5 Hour Energy. Neuenberger and Koch, locked-in before this arrangement, would line up 27th and 33rd under NASCAR’s new rain-out qualifying procedure. However, when the green flag dropped, the race turned disastrous for MacDonald Motorsports. Entering turn three, Mike Bliss tried to pass Neuenberger’s #81, but the two made contact, sending Neuenberger spinning up the track - directly into the path of Koch’s #82. The two cars collided, tearing apart the left-front wheel assembly on the #82 with the driver’s door of the #81. Both drivers were uninjured, but Koch’s day was done. The car, stuck on pit road, was towed behind the wall before the race restarted. Neuenberger returned to finish 33rd, forced to park after 70 laps for failing to meet the minimum speed requirement. 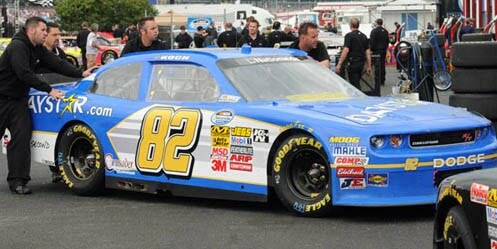 *Both MacDonald Motorsports and the #82 had not finished last in a Nationwide Series race since 2010, when Matt Carter scored his own first last-place finish after his #82 Mobile-Shop.com Dodge lost its brakes after the opening lap of the 2010 Zippo 200 at Watkins Glen. *A Nationwide Series driver had not finished last due to an opening-lap crash since 2008, when Kertus Davis’ #01 RaceGirl Chevrolet wrecked in turn eight during the first circuit of the 2008 Corona Mexico 200 at Mexico City. *This was also Dodge’s first last-place finish in NASCAR competition. The last time a Dodge finished last in any of NASCAR’s top three divisions was last November, when Dennis Setzer’s #92 K-Automotive Motorsports Dodge fell out with a vibration 3 laps into the 2010 O’Reilly Challenge at Texas. The date was Sunday, October 5, 2008. With shade from the fast-approaching darkness covering much of Talladega Superspeedway, the white flag finally flew across the wreck-depleted field of the AMP Energy 500. After more than three-and-a-half hours and ten cautions, it was now every man for himself. Sitting second, shadowing leader Tony Stewart’s every move, 24-year-old Regan Smith sat anxiously in his virtually-unsponsored black #01, fingers welded to the steering wheel, trying to look for any opening he could find. Before the restart, Paul Menard and Aric Almirola, Smith’s two teammates from Dale Earnhardt, Incorporated, were locked onto his rear bumper, each determined to put one of their struggling team’s cars into victory lane for the first time in more than two years. Almirola was shaken out of the draft on the restart, but Smith could still see Menard’s bright yellow Chevrolet fill his rear view mirror, rekindling memories of that fabled “23 Car” Michael Waltrip and Dale, Jr. made famous years before. Entering turn three, Smith chose to lay back, earning him a helpful shunt from Menard. Now, the two were gaining ground on the leader again, ready for a last-minute assault on Stewart. As the leaders stormed into the tri-oval, Smith took a look up high and Menard followed, but Stewart threw the block, leaving the bottom wide open. Smith quickly cut low, and as Menard tried to follow, Stewart cut across Smith’s nose. The two made contact and Smith turned left, steering his car onto the flat apron to avoid a certain wreck. The checkered flag in sight, Smith held his ground, blended back up the track to pick up Menard, and began to inch ahead. As Menard closed once more, the checkered flag dropped. And Regan Smith had won. Down on pit road, crewmen in the #01 pit, their blank uniforms bearing only the signature of their fallen team owner, leapt into each other’s arms and cheered wildly, running in circles in unrestricted joy. On the backstretch, Smith let down the window net to release his pumping fist as Menard pulled alongside to congratulate him. It was a tremendous moment, a return to glory for a team that just a short time earlier had dominated the restrictor-plate tracks, headed by the sport’s most popular driver under its most revered name. And then it was all taken away. Not just the victory was lost, but also the team. That fateful judgment call which left Smith 18th in the final running order spelled the final death knell for DEI. Just a few weeks later, what little sponsorship the team still had dried up and the they closed its doors, laying off dozens of employees in the process. As what little remained of The Intimidator’s program merged with Chip Ganassi Racing, Smith accepted his Rookie of the Year award as one of the unemployed. In a cruel twist, it was the “Yellow-Line Rule,” a measure enacted in the shadow of Dale Earnhardt, which had cut down a living reminder of his legacy. It was wrong then, and it always will be. But if anything positive is to be derived from that dark October day, it is that Smith found a home at Furniture Row Racing, paving the way to what transpired at Darlington last Saturday. In a sport where it’s practically expected that one’s Cup team headquarters will be based in the vicinity of Mooresville, North Carolina, Barney Visser and Joe Garone’s Denver, Colorado-based team, like Smith, has been an underdog in every sense of the word. Invariably bearing the sponsor that is the team’s namesake, their distinctive #78 Chevrolets first hit the track in the Nationwide Series at Nashville in 2005 with Jerry Robertson behind the wheel. After eight starts in the series, the team quickly moved to Cup that September with Kenny Wallace coming home 34th at Dover. The following year, Wallace barely missed racing into the field for the 2006 Daytona 500, but stayed with the program through 28 more starts, culminating with both he and one-time teammate Joe Nemechek putting two Furniture Row Chevrolets into the field for the fiftieth running of the Great American Race. Following the collapse of Ginn Racing in 2007, Nemechek had joined Furniture Row late that year and was tabbed as driver for the #78's first full season in 2008. With multi-car programs holding the key to understanding the new “Car of Tomorrow,” Furniture Row struggled to make the adjustment to full-time competition, missing four races that year. Even so, Nemechek’s restrictor-plate prowess gave the team valuable exposure. Besides the speed he showed during time trials for the 500, the veteran scored them their first pole at Talladega in the spring of 2008, an 18th-place finish at Daytona that July, and what was then a team-best 11th the day Smith’s win was taken away. But, after a 37th-place showing in the 2008 points standings and five last-place finishes in their first four seasons, Visser and Garone were looking for a change. They found Regan Smith. Aware of their 2008 struggles, Furniture Row scaled back to a part-time schedule in 2009 that would include just 20 of the season’s 36 races, even at the expense of skipping the qualifying event for the All-Star Race. The team would also debut a fresh new look to their Chevrolets, their garish brown-and-white machines replaced with flat black cars that resembled the ones Smith had driven at DEI. In their first outing together, Smith put the team into its second-consecutive Daytona 500 and finished a healthy 21st, followed by a 19th their next time out at Las Vegas. Despite damage sustained in an early crash, the pair came home 15th in their return to Talladega, then finished 12th in the summer Daytona event. That fall, a cut tire led to a crash at Richmond, ending Smith’s unprecedented 53-race streak of finishing every Cup race he’d entered. Still, to this day, Smith is one of only a handful of Cup drivers - including Kasey Kahne and Kevin Harvick - without a single last-place finish in any Cup or Nationwide Series points races. In fact, Smith’s only last-place run in NASCAR came early in his Truck Series career, when a two-truck crash took his #47 Ginn Resorts Chevrolet out of the 2007 Kroger 250 at Martinsville. Though Smith failed to qualify for two races late in the 2009 season, Visser and Garone were satisfied with the team’s progress and re-signed Smith for a run at the full 2010 season. The objective: finish in the Top 35 in Owner Points. After a rough start to the year, Smith and Furniture Row ultimately attained their goal last November, coming home 29th in Owner Points to lock themselves into the first five races of this season’s campaign. For the first time, both team and driver had successfully run an entire Cup schedule. A strong run in the Gatorade Duels put them 11th in the Daytona 500 field. At Talladega in the spring, they led for three laps and were still running with the leaders late in the event before an engine failure left them 39th. Through 36 races, Smith finished inside the Top 20 ten times. Half of these finishes came in the Chase, where the team became known for its daring efforts to stay out on late restarts with old tires in an effort to capture a solid finish. Even after most of the team’s equipment was destroyed in a frightening freeway pileup in Colorado just days before the season finale, the team showed tremendous heart, banding together with the aid of their fellow competitors. They qualified 10th that weekend and came home 17th. No longer worried about the dreaded “go-or-go-home” qualifying sessions, Smith and Furniture Row turned their attention to SpeedWeeks 2011 with dramatic results. In the Gatorade Duels, Smith teamed up with Kurt Busch, one of the fastest cars of the week, and nearly outmaneuvered Busch for the win. The two paired-up again in the 500 and Smith again returned to the lead, pacing the field for six laps while dodging all the early wrecks. Even after Busch turned Smith during a late-race restart, Smith rebounded once more and finished 7th, scoring the first Top 10 both driver and team had ever scored in the Cup Series. From there, Smith became the king of Fridays, never qualifying worse than 18th in the first nine races including an outside-pole at Richmond that was one of seven performances inside the Top 10. While those nine races gave Smith the best average start of the series, however, luck suddenly eluded him on race day: in the six races that followed the 500, he never cracked the Top 20 and suffered a pair of DNFs. It is indeed most curious that at Darlington - a track where Smith had never finished better than 17th and where he had on Friday qualified a season-worst 23rd - that he once again found himself in a green-white-checkered battle for the lead. Only this time, it was different. There was no yellow line, no frustration, no heartbreak. In fact, the race’s most controversial moment didn't involve Smith at all. Instead, there was only the unparalleled thrill of victory. The thrill of winning at a track that rewards legends for their tenacity and bravery: veterans like the one Regan Smith has become during his brief journey in this sport and teams with the entrepreneurial spirit of Furniture Row. Because today, Regan Smith is a champion of the Southern 500. And Furniture Row Racing has brought hope to the struggling start-up teams of today. Michael McDowell picked up the 10th last-place finish of his NASCAR Sprint Cup Series career in Saturday’s Showtime Southern 500 at Darlington when his #66 K-LOVE Toyota fell out with a vibration after completing 7 of the race’s 370 laps. 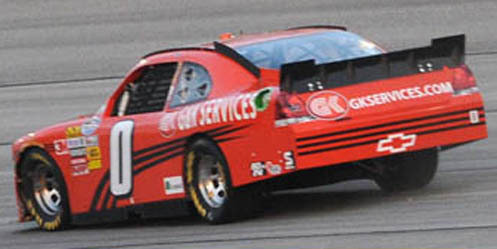 For the second consecutive week, McDowell and the HP Racing LLC team had full sponsorship from Christian radio network K-LOVE, allowing the team to run an entire Cup race for the third time in 2011. In the latter portion of Friday’s “knock-out” qualifying session, McDowell locked the team into the show, picking up two spots on his second timed lap with a speed of 175.353 mph, good enough for 39th on the grid. At the start of Saturday’s race, McDowell was working his way through the field when disaster struck on Lap 5. Heading down the backstretch, trying to pass Mike Skinner’s #60 Big Red Toyota on the inside, Skinner suddenly turned left, damaging the right-front fender of McDowell’s Toyota. Skinner spun to the apron of the track, bringing out the first caution of the race. As Skinner pulled his virtually undamaged car behind the wall, McDowell’s crew told him to go to the garage as well. Though the crew pointed out the #66 had only minor damage to the fender and a hole in the nose, it was decided to call it a night and save the car for next week’s race at Dover. Radio communications indicated that McDowell was upset at the early misfortune and was seeking out Mike Skinner to have a heated discussion about the contact. There have been no reports of such a confrontation, however, and Skinner returned to the track 25 laps down later that night. Once Skinner had dropped McDowell to 43rd and moved past Joe Nemechek and David Stremme, two other early exits, Skinner’s Germain Racing team also pulled the plug and he came home in 40th. *The #66 had not finished last at Darlington since 2000, when Darrell Waltrip’s #66 K-Mart / Route 66 Ford fell out with handling problems after completing 116 laps of the 2000 Mall.com 400. *A Cup Series driver had not finished last at Darlington due to a vibration since 2004, when Joe Ruttman’s #09 Miccosukee Resort and Casino Dodge left 22 laps into the 2004 Carolina Dodge Dealers 400. *McDowell had never before finished last in a Cup race at Darlington. It was a rough weekend for owner Dusty Whitney, who attempted to enter two cars into Saturday’s race for the first time since last fall at Phoenix. In qualifying, Scott Riggs, driver of the unsponsored second team, #81, had just completed his first timed lap when the engine exploded in turn one. Ultimately, Riggs became the fastest of the three teams to DNQ, having been edged for the 43rd spot by Joe Nemechek. J.J. Yeley and the team’s lead #46 had qualified 31st for Saturday’s race and remained on the lead lap in the early going, only to blow an engine in the exact same spot 34 laps into the race. James Hylton picked up the 2nd last-place finish of his NASCAR Nationwide Series career in Friday’s Royal Purple 200 at the Darlington Raceway when his #0 G&K Services Chevrolet fell out with rear end problems after completing 2 of the race’s 147 laps. In its ninth season of Nationwide competition, Johnny Davis’ team has shown marked progress. Last month at Talladega, Mike Wallace suffered damage to his #01 Chevrolet early, but vaulted to the lead for six laps with drafting help from fellow underdog Joe Nemechek. It wasn’t until the final lap, when a spectacular crash ended Wallace’s run, that he fell to 18th in the final running order. Talladega also saw three of the Davis team’s four best finishes, including its best-ever run of 3rd in the team’s debut with driver Tim Fedewa in 2002. Wallace would again pilot the #01 at Darlington, along with the #51 of rising star Jeremy Clements. On Thursday, it was then announced that Davis would enter a third car, #0, for a driver he used to crew chief for in the 1980s: 76-year-old James Harvey Hylton. Long before his current career of competing full-time in ARCA, Hylton began his career in 1964 and became one of the most enduring figures of the NASCAR Sprint Cup Series. In his first full season of competition in 1965, Hylton claimed Rookie of the Year in style, finishing a close second to David Pearson. For the next seven seasons, he finished no worse than 7th in points, including two more runner-up finishes in 1967 and 1971. After he became an owner-driver in 1968, Hylton scored two Sprint Cup victories at Richmond and Talladega and continued to qualify for Cup races all the way until 1993. Just four years ago, at the age of 72, Hylton even nearly raced his way into the 2007 Daytona 500 before mechanical woes derailed his strong run late in the Gatorade Duels. Coming into the Darlington race, Hylton had also made just three Nationwide Series starts: one each in 1982, 2006, and 2008. In his most recent start, which came in the 2008 Winn-Dixie 250 at Daytona, Hylton had driven one of Johnny Davis’ Chevrolets to a 36th place finish, completing 82 of the race’s 105 laps. That race saw the 73-year-old Hylton set the record for the oldest driver to start a NASCAR race - a record Hylton himself broke on Friday. Rain washed-out qualifying on Friday, so all 43 cars on the entry list made the show for the Royal Purple 200 in a field set by owner points. With no prior starts for the #0 in 2011, this put Hylton at the back of the field in 43rd, soon to be joined by outside-polesitter Clint Bowyer, who missed the driver’s meeting. Two laps into the race, Hylton went behind the wall under green, following David Green in owner Jay Robinson’s #49 Acredale Vending Chevrolet. *Hylton has only one other last-place finish in Nationwide Series competition, which came in 2006 when his #28 Speed Zone Energy Drink / Advil Chevrolet fell out with brake problems 4 laps into the 2006 AT&T 250 at Milwaukee, scene of his first series start since 1982. Hylton has nine last-place finishes in his 29-year Sprint Cup career. The ninth of these finishes came in his next-to-last race, the 1993 GM Goodwrench 500 at Rockingham, when his #48 Rumple Furniture Pontiac broke its oil pan 24 laps into the event. *The #0 had not finished last in a Nationwide Series race since 2009, when Mark Green’s SponsorDavis.com Chevrolet fell out with a vibration after completing the opening lap of the 2009 Federated Auto Parts 300 at Nashville. As indicated by the sponsor, this, too, was a Johnny Davis-owned car. *A Nationwide Series driver had not finished last because of rear end trouble since 2010, when Justin Marks fell out during the opening lap of the NAPA Auto Parts 200 at Montreal. J.J. Yeley picked up the 4th last-place finish of his NASCAR Sprint Cup Series career in Saturday’s Crown Royal presents the Matthew & Daniel Hansen 400 at the Richmond International Raceway when his #46 Red Line Oil Chevrolet fell out with electrical problems after he completed 38 of the race’s 400 laps. Eight races into a season that began with his blown engine 11 laps into the Daytona 500, resulting in what was his most recent last-place finish, J.J. Yeley and the Whitney Motorsports team have finished just one race in 2011, a 26th-place finish at Talladega two weeks ago. In that race, Yeley took over for Bill Elliott, who qualified the car, but the effort was not able to bring the team any closer 40th in Owner Points, 72 points outside the Top 35. Though just one team would miss the field for Friday’s race, qualifying was still a game of inches for the #46 team. Following an engine failure in Happy Hour, the team’s backup engine would see its first laps when it mattered most. With just a handful of cars left to time into the race, Yeley’s task was to run a faster time than Tony Raines, whose lap in the Larry Gunselman #37 was then slowest among the “go-or-go-homers.” Then, at the last possible moment on his final lap, Yeley managed to edge Raines for a spot in the race by just one thousandth of a second: a 21.516 second-lap (125.488 mph) to Raines’ 21.517. Ultimately, Raines also made the race after Brian Keselowski, seeking to make his return to the Cup Series following gallbladder surgery, ran a lap just over three-tenths slower than Raines. Yeley’s engine change forced him to surrender the 38th spot on the grid, joining Joe Nemechek, who voluntarily fell back from 26th for what turned out to be a short night for him as well. Yeley and Nemechek were among the first cars to lose a lap during the first 50 laps and, soon after, both pulled behind the wall under green. Yeley edged Nemechek by two laps, securing his second last-place finish of 2011. After slowing on the backstretch, he drove directly to the hauler, and debriefed with the team on the car’s handling over the radio. *Yeley’s last-place finish in a Chevrolet ends a streak of seven consecutive 43rd-place runs for Toyota, dating back to Yeley’s Daytona 500 finish with the same team. *Yeley is the first driver to finish last in a Cup race at Richmond due to electrical problems. However, in the fall of 1981, Mike Alexander’s #37 Rogers Auto Leasing Buick fell out with wiring problems that kept him from completing a single lap of the 1981 Wrangler Sanfor-Set 400 at Richmond. *Neither Yeley, nor owner Dusty Whitney, nor the #46 had ever before finished last in a Cup race at Richmond. On Lap 44, Mike Skinner pulled his #60 Big Red Toyota behind the wall, but soon worked out a plan with his crew chief to run some more laps after adjustments. Skinner returned to the track on Lap 68, 24 laps down to the leaders, then called it a night on Lap 85. He finished 41st. For the second time this year, Michael McDowell was able to run a full race in HP Racing LLC’s #66. This time, the team had primary sponsorship from K-LOVE, a Christian Radio network that funded McDowell’s Nationwide Series effort last year. It was the first time one of Phil Parsons’ Toyotas had a primary sponsor since the 2010 Daytona 500, a race for which McDowell had qualified for by racing his way in through the Gatorade Duels. On Saturday, the #66 K-LOVE Toyota lost a lap early, but the crew was gaining on the setup when the car started to gradually lose battery power due to a loose alternator wire. The team continued to run the car as long as they could, trying also to rebound from a fueling issue on pit road, until the battery failed on Lap 139. Their car forced behind the wall, the crew diagnosed the battery problem, but struggled with the repairs, and ultimately called it a night on Lap 159. McDowell finished 40th.